Beautiful, brand-new home with 2 bedrooms upstairs, 3 full baths, and an optional guest room/office/media room in sought-after Cameron Harbor community steps from Chattanooga's Riverwalk and Blue Goose Hollow Park. 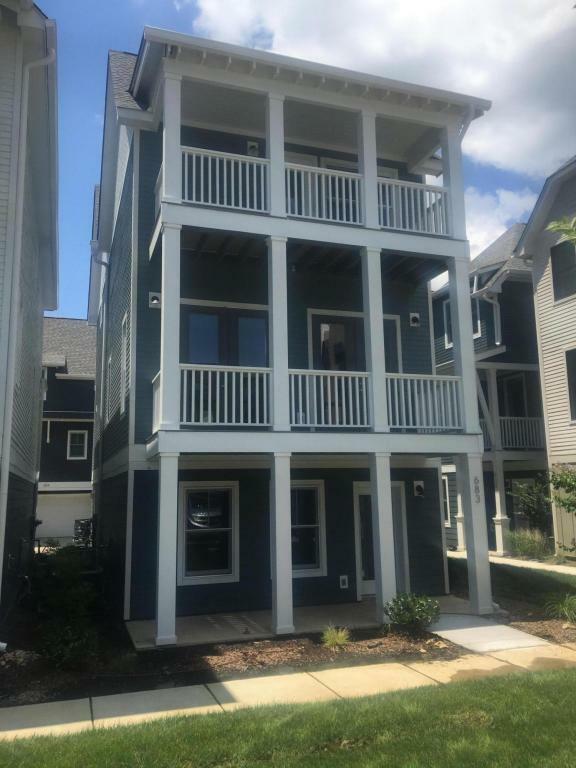 This fully upgraded home features 3 balconies, quartz kitchen and bathroom countertops, upgraded appliances including GE Profile Gas Range, Convection Microwave and Oven. There's a full pantry and plenty of soft-close cabinets.The expansive open floorplan on the main living level includes an extended island for extra seating, a separate space for dining room, a powder room, and full height french door windows out onto your Charleston-style balcony. Crown molding adds to the modern-classic style of this designer home.On the third level bedroom-one features two closets and a full bathroom. The Master Bedroom has vaulted ceilings, two walk-in closets, and a private balcony. In the Master Bath, there are double sinks, a walk-in shower, and separate soaking tub, plus a toilet closet. There are a laundry room and linen closet off the hallway connecting the two bathrooms. On the first floor enter through the spacious open extra den/office/guest room where there are a full bath and closet. At the back of the house, you'll find the two car garage with extra storage for bikes, kayaks or other gear. At Cameron Harbor, you'll have access to beautifully maintained grounds, a fire pit, a workout room, and an indoor community pool. Plus you're just minutes from walking or biking to the heart of downtown Chattanooga or the city's Southside. The entrance to the community is across from the newly complete Chattanooga Whiskey Distillery and next door you'll find one of the newest parks to line the famous Chattanooga River Walk--Blue Goose Hollow is complete with public art installations, bike rentals, bathrooms and covered picnic areas. There's nothing quite like this available right now in downtown Chattanooga and you simply cannot beat the location, amenities, and space! Come and see it and start living your downtown dream today!